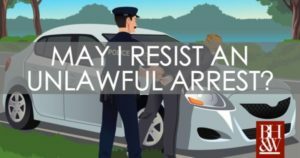 May a Person Resist an Unlawful Arrest in Texas? Home » NEWS » May a Person Resist an Unlawful Arrest in Texas? Resisting Arrest: How is it defined under Texas law? Transporting a person accused of a crime. Resisting arrest requires the person to have used force against the arrest, but it does not require the officer to be acting lawfully in making the arrest. To be guilty of resisting arrest, the force need not only be directed at or toward the officer but is also met with any force exerted in opposition to, but away from the officer, such as a simple pulling away. Thus, even small uses of force can give rise to a charge of resisting arrest. However, non-threatening statements of disagreement with the officer’s actions usually are not enough to qualify as resisting arrest. Can You Resist an Unlawful Arrest in Texas? One of the most important cases on this point is Ford v. State, 538 S.W.2d 633 (Tex. Crim. App. 1976). What Ford provides, in short, is that you may not resist an arrest—whether lawful or unlawful. Historically, American citizens were legally entitled to use reasonable force to resist an unlawful arrest. Several states have now eliminated – either by statute or by judicial decision – the common law right to resist an unlawful arrest. Section 38.03 of the Texas Penal Code eliminated this right. Furthermore, subsection (b) of Section 38.03 specifically states it is no defense to prosecution that the arrest or search was unlawful. In Ford, the Court held “the elimination of the common law right to resist arrest reflects a growing realization that the use of self-help to prevent an unlawful arrest presents too great a threat to the safety of individuals and society to be sanctioned.” The Court reasoned that the line between an illegal and legal arrest is too fine to be determined in a street confrontation; it is a question to be decided by the courts. Furthermore, the Court has concluded that by limiting the common law right to resist an unlawful arrest, the Legislature has not limited the remedies available to the person arrested, and thus, there is not a violation of the person’s constitutional rights. Regardless of whether a person is guilty of the underlying charge that prompted the attempted apprehension, resisting arrest is a serious charge in Texas (many time more serious than the underlying offense). A person can face a significant fine and jail time. However, the charge may be enhanced to a felony of the 3rd degree if you use a deadly weapon, such as a gun or a knife, to resist the arrest or search. An individual convicted of a felony of the 3rd degree may be sentenced to 2-10 years in the Texas Department of Corrections and a fine up to $10,000. Our advice is to comply with the officer’s demands calmly and politely and let us work out the legality of the arrest later.